All texts copied below from libcom.org, submitted by taxiki pali. The demo, organised by several anarchist collectives, marched to the police station, where it was confronted by strong riot police forces. The protesters tried to break through the blockade by throwing stones to the police. In the clashes that ensued several people were detained, out of which some are being reported as arrested and charged. The protesters then regathered and occupied the city hall in a surprise move. The mayor of the suburb, a Communist Party (KKE) cadre, has visited the occupied city hall and has declared that the police should by no means attempt to evacuate the 300 protesters who remain in it, nor arrest anyone leaving the premises. 400 protesters gathered today October 17 in the streets of Nikea in a march of rage against the recent assassination of the 25 year old pakistani immigrant Mohamed Karman Atif by torture in the police station of Nikea, a march called by anarchist collectives and a local assembly of the area. We crossed the main streets of the area, from the house of the murdered man and moved towards the police station. Strong riot police forces (MAT) and motorised police forces (Z-team) that “accompanied the demo have proved the official stance of the now Socialist Ministry of Public Order (Ministry of Citizens Protection): whitewashing and protecting torturers murderers, the police occupation of the area. All that was happening will continue as normal: beatings, torture, humiliations in all the police stations of the country. During the protest march there was strong rain. But what rained near the police station of Nikea was not just water drops. The riot police brigade blocking the way to the police station received a rain of stones. The organised continuation of the march and the retreat from the hot-spot was hampered by a combined force of riot policemen at the back and on the sides of the march. Our defenses held, while locals from the sidewalks swore and verbally attacked the police army of occupation. Yet, in a cloud of tear gas and glob attacks some got cut off from the march and as a result they were detained. The march was completed in the location perivolaki, as planned and given the detentions a great number of the protesters moved to occupy the city hall demanding the immediate release of the hostage comrades. Some people who decided to leave were stopped by motorised police forces and were also detained. The exact number of detentions is yet not known, but is certainly double-digit. The process of arrest has already started for some. This is the apex of the new state dogma of “democracy and strength” as announced by the new minster of Public Order Michalis Chrisochoidis against the world of the insurgency and anyone potentially resisting. It is like two days ago during the demo of the Perama shipyard workers and unemployed at the Ministry of Labour. It is like the now police-occupied Exarcheia. It is like the recent persecutions of high-school occupations. It will be the same with the dockworkers of Peiraeus who are against the sell-out to COSCO, or the 1,400 workers of the Skaramangas shipyards threatened to be sacked.Police barbarity is only the repressive side of state-capitalist barbarity: oppression, exploitation, subjugation, death. The new political management’s main role is to manage the social dimension of the crisis of our times: the all-expanding disobedience to and clash with the demands of political and economic power. There is no place for illusions. No change will come from no new government. This has always been the case.State terrorism continues and with it continues the struggle for social and individual liberation, for a free world without power. Immediate release of detained protesters! Removal of all accusations against them! Immediate retreat of all police forces from the neighborhoods of Nikea and from around the city hall! The assembly of the occupied city hall of Nikea. 5 out of the 8 arrested protesters who were led to the courts today are being charged under the “anti-hood” law of the previous government which transforms any breach of the law into a criminal offence if the court accepts that the protesters were wearing hoods or covering their faces. This means that any breach of the law “under a hood” can be punished by maximum 10 years imprisonment. Given that many anarchists in greece wear hoods as a symbol of their ideology this is considered to be a re-activation of the 1930s “idionimo” which imprisoned and exiled people of communist convictions. The parody of justice is even more apparent by the fact that in the day of the march it was raining, so penalising wearing a hood is more or less a conviction to illness or a prohibition of protest in winter conditions. It is the first time that the onerous anti-hood law is being applied. As a result, the occupation of the Nikea city hall holds strong. It must be noted that bourgeois media have imposed a total black-out on the events, pointing out that the Minister of Public Order, who was decorated by the CIA in 2003 for his anti-guerrilla operations, has activated his old methods of “media guidelines”, i.e. censorship on issues of human rights and civil order that might be harmful to the government. The municipal workers association of Nikea stand in solidarity with anarchists occupying the city hall since Saturday. As the occupation of the city hall of Nikea enters its third day, the support of locals so visual during the protest march regarding the police torture and death of Mohamed Karman Atif, which led to serious clashes with the police and 8 arrests last Saturday 17/10, has been expressed in a communique by the municipal worker’s association of Nikea. Nikea City Hall is occupied by anarchist groups from the afternoon of Saturday after a protest, for the death of the unfortunate Pakistani immigrant that took place in the Police Station of Nikea. The Workers Association demands that the forces of repression leave from within the boundaries of the historic City of Nikea. The occupation of the City Hall by the protesters is a political act, and the attempt to criminalise it is unacceptable and undemocratic. The workers of Kokkinia [red neighborhood] disapprove strongly the attack of the forces of repression against the demonstrators and the mindless use of chemical gasses in a densely populated area. The police rule imposed cannot intimidate protesters and workers. We demand the immediate clarification of the case of the death of our fellow human being, the immigrant. We call the Minister of Protection of Citizens [Minister of Public Order] to deal himself with this dark case and not attempt to conceal or whitewash this tragic case. 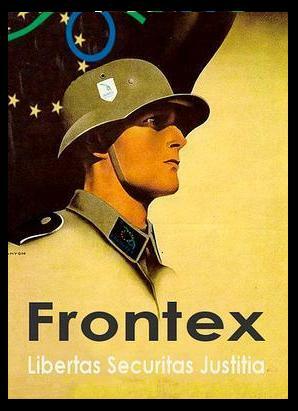 The Association of Workers protests strongly against xenophobia and racism that extreme-right centers and para-centers are trying to impose on Greek society. -THE REPRESSION FORCES NOT TO RAID THE NIKEA CITY HALL. -THE IMMEDIATE WITHDRAWAL OF THE POLICE FORCES FROM WITHIN THE BOUNDARIES OF THE CITY OF NIKEA. -THE CLARIFICATION OF THE CASE OF THE DEATH OF THE PAKISTANI IMMIGRANT. 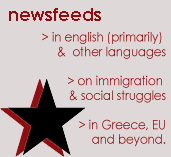 -THE DEMOCRATIZATION OF GREEK POLICE AND THE FIRING OF EXTREME-RIGHT ELEMENTS IN ITS RANKS. A brutal incident of police violence occurred on the evening of September 26 in Nikaia, Athens. The victim a 25 year old immigrant, who died yesterday of his wounds. Petros Constantinou of the movement “Together against racism and the fascist threat”, talked to tvxs about the events that caused Pakistanis’ Mohammed Kamran Atif death. On 26 September, at01.30 at night, 15 police officers raided the house of the young immigrant at 82 Ilioupoleos str., Nikaia, shouting and beating both himself and his family. The neighboors who witnessed the incident say that the deceased was just semi-conscious, and that while he was being carried out of his house his head kept banging on the stairs while he and his family were getting off the house crawling. Against him there was a complaint for child beating. He was then taken to the Nicaia police station, which turned into a torture chamber. Kamran remained in detention for two days. The charge against him remained ungrounded, and the complainant withdrew his charge . Kamran was then released and he himself described to his family the horrific moments he had gone through. “He was tied hand and foot and banged with clubs and then subjected to electroshock with wires on his hands and knees” is the testimony of Kamran’s amily. Both the family and the neighbors knew about the abuse Kamran had suffered . Fear kept him away from the hospital since Kamran had no documents. The police tried to cover up the incident. Kamran’s brother was pressured and misled to testify that his brother brought no bruises when he left the police station. Tomorrow on (Sunday 11 Oct) at 16:00 in the house of Mohammed Atif Kamran an interview and a protest wil take place organised by the Pakistani community in Greece, “United Against Racism and the Fascist Threat” and ” ANTARSYA. About 150 immigrants detained at the airport “Eleftherios Venizelos” began a mass hunger strike on Sunday. The immigrants from Pakistan, Bangladesh and India had been living and working for years in Greece. When they went for a visit at their country, they received the necessary documents from the pertinent municipalities, which would allow them to return. Upon return, though, the authorities did not allow them to leave the area of the airport, claiming that their documents had been forged. July 2: Accident in the construction site of the Larissa-Trikala National Road; a 26 year old from Larissa, was electrocuted while instaling lighting poles – forunately, he survived. July 3: A twenty-something guy from Pakistan, working in the chain of pizzerias “Bellisimo” had a serious accident while on delivery route, and he was hospitalized for 5 days in Intensive Care Unit of the hospital «Saint Savas»; he is still hospitalized at the State Hospital in Nikaia. 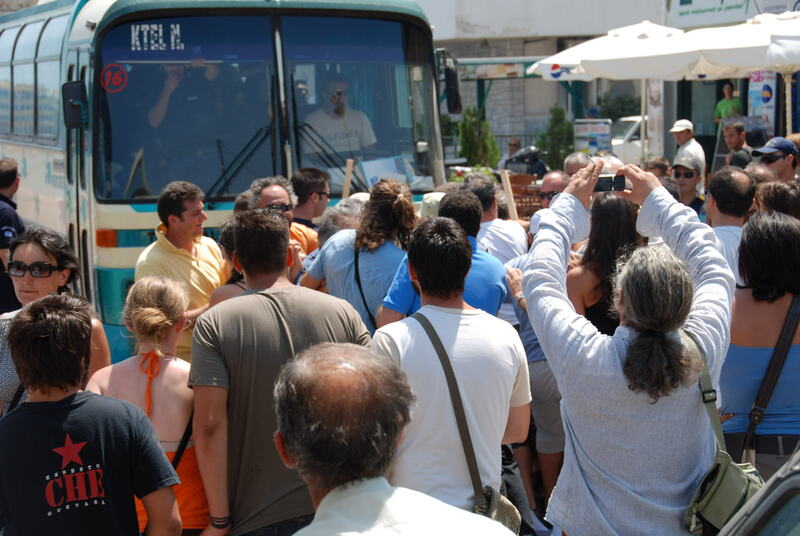 The incident became known last Saturday after complaints of workers in the Tourism – Food Union of Piraeus. If there hadn’t been for the complaint, the accident would not have ever been recorded. It was confirmed that the 20 year old worked there for about a year uninsured, over 10 hours daily, like the rest of his colleagues! Remember that last year on June 24, the 19 year old Rechman Mahmoud from Pakistan, an uninsured delivery employee of the Belissimo pizzeria in Kolonos, Athens, was hit by a car at the time of work and after ten days in a comatose condiution he died. July 7: The 45 year old Schygulla Mustaffa died a tragic death while working in the tunnel of the Train Organisation of Greece, near Aghios Stephanos, Domokos, Central Greece. The site was operated by the construction company «AKTOR». July 14, a 61 year old man was fatally wounded at the dock of ship the ship repair company «NEORION SA» – a group of companies based in Piraeus, 67, Akti Miaouli – and Syros. July 22: A severe accident, with one dead and twenty people injured, occurred shortly after 16:00 in KOUKOUTARIS A. «ALFA» SA, frozen dough products industry, which employs 165 workers and has branches in Athens, Thessaloniki and Ioannina. The accident was caused by a leakage of gas in the building after some complication in a tank used to cool the refrigerators. A 35-year old woman succumbed to injuries in the hospital of Kozani. Apart from the unfortunate woman, five other employees with severe burns have been tranferred to the same hospital; more workers at the same shift suffer lung problems. -Another man in the long list of murders: During trench excavation works, a 50 year old worker of the Municipal Enterprise for Water Supply and Sewerage of Katerini, Central Macedonia Region, was crushed by soil. He was at a depth of approximately 1.70 meters when the pit wall collapsed. An “accident” occurred in the quarries of Lamia, Central Greece, operated by the company «UNITED QUARRIES SA» (3, Truman str., Lamia) and it resulted in the amputation of a the 55 year old Nicholas Hrysos, who lost fingers from both hands. The «accident» took place during the placement of of some explosive device. July 23: A fatal «accident» occured at the roadworks in the Louros area of Preveza. The victim was Vassilis Panagiotou, a 23 year old from Filiates. The unlucky worker was tragically killed by electrocution, when, while lifting iron pillars from a crane vehicle, he touched a power line of PPC. July 25: Ntanout Noumitratsi (Danut Dumitrachi, a 39 year old working at Mantoudi, Evoia, died a tragic death – he was crushed by volumes of scrap metal. The unlucky laborer was working for the company «Terna» (Mesogion 85, Athens. According to information, the safety standerds were far from met. July 27: a bus driver, during a journey to Moudania, Halkidiki, lost control of the vehicle which ended in a field with olive trees. The passengers were unharmed but the driver was transported to the Health Center of Moudania where it was found he had suffered from a heart attack, which caused his death. July 28: The 50 year old builder George Michalas, who works for the subcontracting company «Athanasopoulos – Bakalaros» was buried alive. The particular project at the shore of a river is undertaken by the Mechaniki company. What is indicative of the working conditions leading to such accidents is the fact that the 50 year old worker had working since the morning at the site and he was injured at 7 pm! At some point the ground collapsed and the soil fell on the man, since the protective iron used in these cases was absent as well. The 50 year old worker was rescued by his colleagues. July 28: A 54 year old migrant worker in the works of the Electric Power Compani Substation in Leondari, Thessaly, was rescued the last instance, after he had been trapped between a moving crane and a wall. His name is Romelion Voulmpes, of Romanian citizenship and he is working for the company «POSEIDON SA», which has undertaken the construction of the substation. July 31: Another crime, the victim of which was the the 46 year old immigrant from Bangladesh Gulaf Miah happened in Aspropyrgos, at the company «General Recycling – Real Estate Hotel SA – «Γενική Ανακυκλώσεως Κτηματική Ξενοδοχειακή ΑΕ»”. The immigrant was «buried» and compressed under tonnes of recyclable material (paper) for about two days! The last time someone saw Miah alive was a foreman of the company at 10.30 Friday morning. Nobody looked for the immigrant until the family made a statement of disappearance the next day, on Saturday, Aug. 1, at the Police Department Aspropyrgos! The Association of Private Employees and Anonymous Companies Offices launched on 4 / 8 a 24-hour work stoppage. August 2: A 36 year old worker in the factory of LARCO, Larymna, was burnt to death and three of his colleagues were slightly injured in a blast furnace accident at the plant. The three wounded were taken to hospital in Lamia. The fatal accident happened when under so far unspecified conditions, the ore, which at that time had a temperature of more than 3,000 C, leaked. August 3: A propane leak occurred yesterday afternoon during a transfusion from a tanker facilities of a private company, which was at in the Second MOT of Thessaloniki. The driver of the tank, in an effort to stop the leak, was injured by liquefied propane. August 3: An electrocution accident which resulted in the serious injury of the worker Giorgos Bouritas occurred during works to expand the medium voltage substation of High Voltage in Larimna, Boeotia. 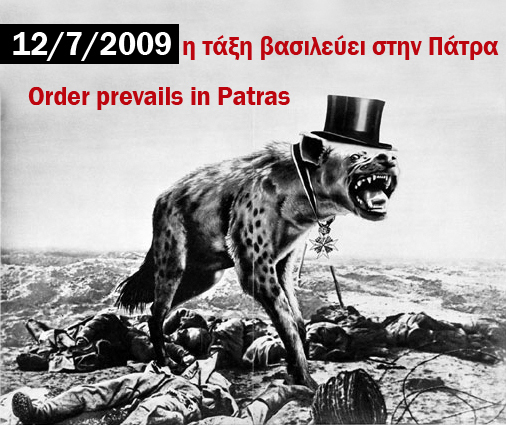 August 4, 2009: A 67 year old night watchman at New Anchialos, Volos, working in the Agricultural Cooperative «Demeter», died while trying to close the iron gate of the entrance of the factory, which crushed and fell on him. The wounded man was taken to the General Hospital of Volos. He died there a few hours later. August 5: The 30-year old Vassilis Katsikis found a horrible death in the worksite of Grammatiko, Attica, when the lorry he was a co-driver on crushed and hot tar toppled on him. This death sheds light on the horrible circumstances under which drivers work, since the trucks carrying the tar are old and do not meet any safty standards. The company he worked for is «Ashpaltiki Attica SA». August 6: A 39 year old worker from Albania, Louska Zekir, was killed while working on projects in the Eleusis – Tsakona road. When a crane lifted scrap of approximately one ton the strap was cut. The worker was working for the company «SELKOS». The site belongs to the subcontractor company Straktor of the Moreas consortium, that manufactures the highway from Tripoli to Kalamata. August 18: A 50 year old worker was Hospital hospitalized after suffering injuries when his truck collided with a second truck in the mines of the Electrical Company, at Kommanos, Kozani, Western Macedonia. August 20: A 28 year old worker at the Greek Petroleum refineries Aspropyrgos Panayiotis League lost his life instantly by falling from a height of about 5 meters. August 21: A 30-year old worker from Albania was killed while working at the gas tank industry of «TANK GAS», in Karditsa, Thessaly. The worker was killed by an explosion, while performing coloring works inside a tank. August 26: Shortly before 12 at noon, a furnace explosion killed inside a factory the 27 year old Costas Delis. Due to the explosion there were four more worker wounded; one of them, C. Papaconstantinou, suffered severe burns. August 25: The 38 year old contract employee of the Electrical Company, Panagiotis Hatzidimitriou, was sent to do repairs on columns of electricity cables after 15 days training (the training used to last 6 months some years ago). The “accident” occurred in Thessaloniki, in Lagadas, when the worker fell from a height when he took off his belt to bypass an artificial barrier, while descending from the column he had climbed to repair the damage. He died on the spot. August 26: The 55 year old Haikalis Kyriazidis died an instant death by electrocution while working in Evoia. He touched a wire, while manipulating the crane that loads tubes. The worker was working in the technical company «ERGOROI», which has undertaken the construction of the “biological purification” of urban liquid waste of Istiea. August 27: A 28 year old Greek was crushed by a block of residues of animal food in the warehouse he worked for. He was transferred to the Intensive Care Unit of the Hospital of Rethymnon. His colleagues and firefighters freed the worker, who was left unconscious by the blast. He is hospitalized and lives on life preserving devices. August 28: A 27 year old worker in a painting workshop, in Pandroso, Rodopi, Thrace, was very “lucky”, to fall from a scaffold of five meters, and survive with only minor injuries. August 29: One more labour “accident” occurred on a site of Egnatia highway in the prefecture of Ioannina. A 47 year old worker from Anilio, Metsovo, Ipeirus, who worked for the Egnatia Odos, had his left hand stuck in a cutting machine. His colleagues in the company of “AKTOR” and firefighters freed the worker, who was unconscious. He was immediately transferred to the Health Center of Metsovo and from there, given the seriousness of the situation, he was relocated to the Ioannina University Hospital. Much tension yesterday afternoon at the port of Chios island, where demonstrators, members of the Chios Refugees Solidarity Committee and PAME [note: Communist Party of Greece trade union] tried to prevent the boarding of two buses carrying 60 migrants from the refugee camp of Mersinidi into the F/B «Theofilos» in order to tranfer them to Thessaloniki. Port police and Police broke the blockade of the citizens in the port of Chios and manage to board the hand-cuffed Afghan, Pakistani and Somali immigrants. After the boarding of refugees, one Communist Party member dived in the sea, between the coast and the ship, which caused the ship to leave the island a further one hour later than expected. It should be noted that the transfers of immigrants towards Northern Greece come after the recent law which increases detention time to six months. This has rendered the situation in the centers of Chios and Mytilini extremely tense. The capacity of the Mersenidi center is 120 people, still, already 220 people are detained therein, while in the Mitilini Pagani camp the respective numbers are 250 and 400! People protest because they believe that behind these «innocent» transfers is the attempt to expell immigrants without much «trouble»to Turkey via Evros. On Monday 13/7 trains across Greece came to a halt for 48h as a result of a rolling 3-hour stoopage industrial action by railway workers.At the same time workers at Wind, the mobile telecommunications giant, in Greece declared a 24h strike. Workers of Wind and solidarity workers of other industrial sectors gathered outside the company’s HQ and blockaded its entrance on Tuesday 14/7 morning till the afternoon. The same day locals of Grammaticos who are resisting the construction of an open refuse damp in their area, and clashed with riot police last week erecting barricades and torching company bulldozers organised a protest march towards the riot police blockade of the construction site. The locals clashed with the police throwing stones and other projectiles, including a few molotov cocktails. The battle lasted for about an hour and the locals suffered the extended use of tear gas and ‘blast flash’ grenades. In the prison front, Thodoris Iliopoulos started a hunger strike on the 10th of July 2009. Iliopoulos was arrested on the 18th of December 2008 in Akadimias street during a riot police sweeping operation in the context of the December Uprising. He is held since the 22nd of December in the Court Prisons of Koridallos accused for 3 crimes with no witnesses other than policement. 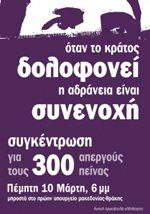 Iliopoulos denies all charges against him, and has launched a long campaign to prove his innocence. On the 8th of July his petition for release until his trial was waived by judges, being the only arrested from the December Uprising to be still held hostage. On beginning his hunger strike Iliopoulos declared: “In go on hunger strike. It is the only means remaining to me as a hostage on order to cry out the truth and denounce the terrible injustice. To denounce the hatred and the empathy of ‘justice’ mechanisms. To denounce the arbitrariness and the violence of a ‘justice’ which is blind indeed, the its even more ‘blind’ functionaries”. In solidarity the convict Nicos Tsouvalakis has also started a hunger strike demanding the release of Iliopoulos and in protest to the dehumanising prison conditions. As of Monday 13 of July the inmates of the First Wing of Koridallos Prison, the central prison of the country in Athens, declared that they abstain from the prison kitchen ration.